After thoroughly enjoying Donald McCaig’s book Eminent Dogs, Dangerous Men, I just finished reading a sort of sequel, The Dog Wars: How the Border Collie Battled the American Kennel Club. Never having come across reason to believe otherwise, I had thought of the AKC as a respectable organization that advances knowledge of dogs and promotes their well-being. 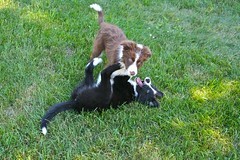 I cheerfully accepted AKC STAR Puppy status on behalf of my own border collie after she completed a puppy training class. So I started reading this book under the assumption that border collie owners “battled” the AKC in an effort to make the AKC recognize and accept their dog breed. In fact, most United States border collie owners — at least those who gave the matter any thought at all — were adamantly against border collies being officially recognized by the AKC. The main official function of the AKC has long been to maintain registrations of dogs, for the purpose of demonstrating that a dog was “pure” in breed, and of some particular lineage. In practice, McCaig describes, many activities of the AKC revolve around hosting show events that are driven by exhibiting dogs for their appearance and physical attributes as opposed to for what they can do. At best, breeding dogs for appearance can hinder their specialized behaviors (like herding sheep), as such traits do not necessarily go hand-in-hand, genetically speaking. But worse, breeding dogs for appearance can introduce physical malaties, resulting in dogs with sundry genetic diseases. As in his previous book, author McCaig himself played a role in the story, as he was significantly involved in spearheading an effort to prevent the AKC from accepting dog registrations of border collies, lest the working utility of the breed be diminished and the risk of poor genetic health be increased. The Dog Wars paints a picture of an utterly idiotic American Kennel Club, which seems to not be able to care any less about the long-term well-being of border collies, and which seems to, for reasons not made clear (either to us the readers or, apparently, to McCaig) stubbornly insist upon incorporating border collies into its ranks. Over several years in the early 1990s, McCaig sought legal counsel and assistance, and help from existing border collie registration associations which concurred that little or no good was likely to come from the AKC accepting their dogs. Unfortunately, the story comes to a somewhat anti-climactic ending when one of the three major border collie registrars seems, while agreeable to the cause, insufficiently interested in providing their support until after the AKC had already started registering border collies. The legal plan fizzled out with nothing further to be done. But while the border collie proponents may have lost the war with the AKC, they won plenty of smaller battles, and still did much good. Through publishing articles about their cause in newspapers nationwide, and eventually gathering attention from national television news programs, their concerns about breeding dogs purely for appearance became more widespread. Public interest in “pure-bred” dogs decreased, and acceptance of dogs of “lesser” pedigree rose. In the end, while the American Kennel Club began registering border collies, most border collie owners ignored the AKC, and continued using the long-established border collie registrars, and attending their own self-governed sheep herding events rather than joining the AKC shows. So much of the risk that McCaig and company were concerned about was mitigated not by winning their plea against the AKC, but by better educating the people whose dogs might have otherwise been negatively impacted. The book is also peppered with side-stories about dogs (mostly border collies, of course) that don’t have anything in particular to do with the main theme of going up against the American Kennel Club. In a poignant style typical of his previous book, McCaig shares about his border collie Silk whose life was drawing to a close. She was not particularly discerning about food, and had little interest for toys. What could he possibly do to make her feel more appreciated, more loved? Silk liked it when [my wife] took her on solo walks because, in a four dog pack, it was a privilege to be walked alone. I took her out for training. I’d stand in the middle of our flock and signal her: go left, go right. I’d show her the bottom of my palms: lie down. I’d signal her to walk up on her sheep; when they broke, she’d cover them. The old, deaf, dying dog ran around the sheep until her tongue hung out. All that we can give a dog that the dog will value is our time. Is the AKC of today the same misguided organization that McCaig tells us about? My limited experience with them as been positive, and this book describes events that took place twenty-some years ago. Judge for yourself, but beware judges — AKC or otherwise — who value your dog’s appearance over your dog’s health, or the health of the entire breed.